Tones Suggested A Token.......Out Came A Token, And Then Another. Tones Say A Lot! I was out earlier this week detecting some older spots. I got a strong signal in the middle 80's, too strong for a penny, audio too smooth & stable for a junk target and moving the coil around suggested something larger then a penny. I guessed a larger token.........popped it out with a screwdriver, closed my eyes, and sure enough, out came a token. There was also a similar signal everal inches away, so I figured another token. "BANG"......out came another nice car wash token. I also dug this old military button, "3rd Dragoon Guards (Prince Of Wales's) - 1855-1928 Brass Military uniform button" A great addition to my ever growing military finds collection. I have said it soooooo many times. 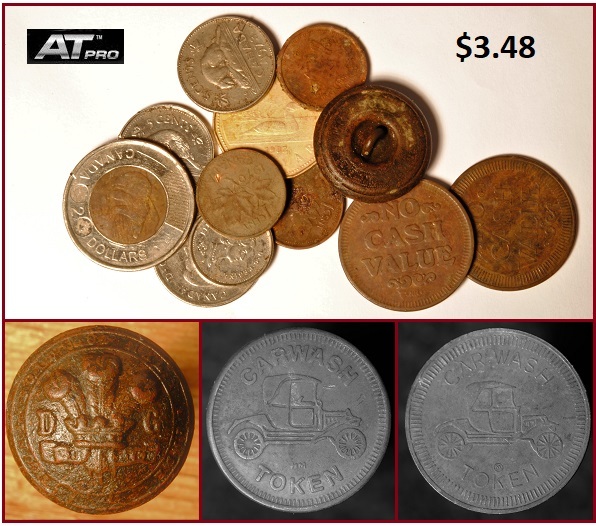 The AT Pro with its great tones is probably one of the best coin/jewelry hunting metal detectors available. And.....I also spent some time highbanking for gold close to downtown Edmonton in the river. Here's about 5 hours worth of digging. I hit a hot spot for sure. Any gold in any rivers near by where you live? 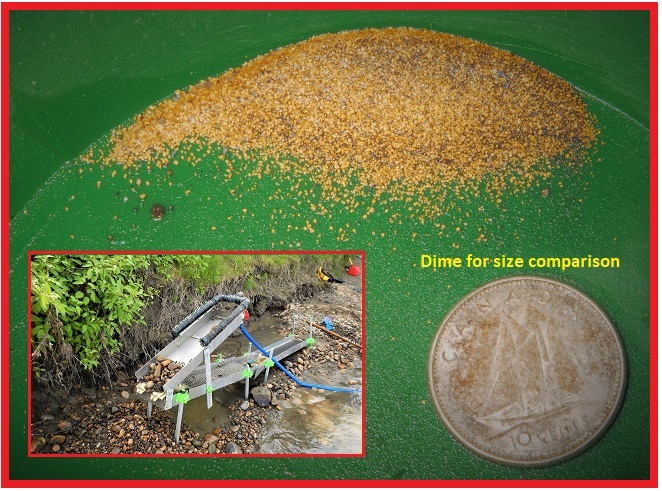 It costs about the same as an AT Series detector to purchase a highbanker and water pump to search for gold, or you can build one for even less. Or........Garrett builds great pans for "panning" for gold. Below is a first for me.....I found one tiny gold chain link in one of the riffles in my sluice box. Wow John, those are great saves. Love to try my hands at some gold one day as it looks like fun.